When Medicare D came out, I was ranting to my hairdresser (who is actually an astute business owner of a successful salon)about it. She supported the measure because her 80 year old father had to take medicine for an overactive bladder and was halving his dosage to save money. I said, how can we justify possibly taxing young people to pay for Baby Boomers going into the program. How could young people, given the demographics, support families if they were taxed to fund this program. Her comment: Well, maybe they should just have to wait to have families and children so that these programs can be financed. You are so right that many out there would support a system of slavery for the purpose of caring for us Baby Boomers in our dotage. By the way, less than 10 years ago, my hairdresser's father and mother traveled the country on their goldwing motorcycles. While I find your continual references to Bush as a child with "adult handlers" quite funny, I feel the phrasing implies that SOMEWHERE in the government there are responsible adults making sure things don't get too out of hand-- taking an objective view of reality, it seems obvious that there are not. The more appropriate metaphor, then, would be that Bush is simply one of the craziest (or perhaps the biggest drooler) of the inmates running the asylum. But I'm not expecting you to give up your cherished metaphor that easily, so in the mean time I'll just continue laughing at it while I still can, that is, before all the things you mentioned in your post just now finally play out and make life in this country quite unliveable. Atrocious, horrifying stuff. I don't believe in the "if you don't like it here, go somewhere else" line of political reasoning most supposed patriotic die-hards resort to when confronted with logic, but I do have to say that if I get the sense that the politicians are going to go ahead and start some kind of a draft (and most people are okay with it happening), I will pack up and leave the country. The risk of guessing will lead to major inconveniences however... if I guess the draft is coming and leave and it never comes, I burdened myself with an unnecessary cost, while if I guess it's coming too late, then I am trapped. I've been trying to think lately of other places I could stand to live and work in after I renounce my citizenship and flee the country (a citizenship which is, from my perspective, only worth something in the sense that at some point it might need to be renounced to officially absolve myself of any "obligations" to the State back home): Switzerland always seemed like such an awfully beautiful country, but from the little bit of research I've done they're just about as socialistic as everyone else. I loved Prague when I went through there last spring for the first time and have also considered one of the former Commie-Bloc nations, but I don't know how easy it would be to get "permission" to live and work there permanently, and adapting to the foreign culture, language and lifestyle might be tough. Then again, there's never a better time than youth to do something "risky" like that. I'd like to solicit your thoughts or those of your readers if you'd be so kind, on the question of, "If you were a young, freedom-loving expat fleeing the country, where do you think you could find the best combination of liveability, workability (opportunities for entrepreneurial activity or a more than modest income) and natural scenic beauty in a new place to call home?" Will, I wish it weren't so but I share your pessimism that these terrors are all but inevitable. The Democrats enjoy decrying the problems Bush has created, but they're just as opportunistic as the next parasitic life form and have undoubtedly already crafted their plans for how to take advantage of the turmoil Bush has created and use it to implement their various "social service" policies. A Second American Revolution might be a possibility, as well. But I know you're opposed to "anarchy" and V-for-Vendetta style retribution because you fear the lawlessness that might follow. But I've always wondered, if the laws are so tyrannical, is the alternative worse? I wonder how one can complain without being a hypocrite if they answer that question in the affirmative. Maybe Mr. Grigg's analysis is overly negative. The support for Ron Paul, particularly among the young, is encouraging to me -- although I haven't yet seen any "Ron Paul Revolutionaries" where I live. If it came down to conscription, I would either leave the country or choose the path of nonviolent resistance. 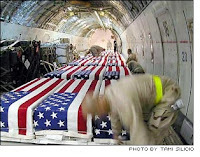 Better to go to prison, however awful that is, than to commit murder for the criminals in Washington D.C. In a sense, there is already "national service." Nearly half of all we earn is confiscated by the government. Thus, half our time at work is effectively conscripted. It's the people, not the gummint. People like to be entertained to death, shun inconviniences more than sin. 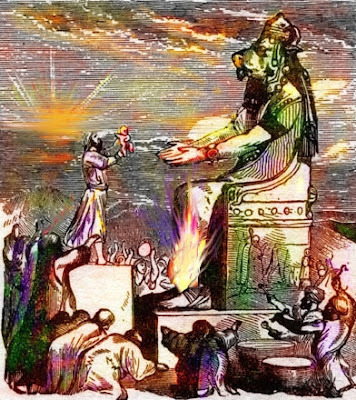 Using gummint to commit ones crimes (murder, theft, idolatry..)is a perfect way to stay clean and yet have all the advantages of abusing others by, if need be lethal, force. Leviathan takes care of the land and its resources, law and justice, your kids (the unwanted ones included), of their 'education' and 'training', of your health, your money and property, your job and wages, the environment, the climate, the roads, the food, ad infinitum..
Stateworship sure has its price like Will showed once again in his article. But what has not? And to the people it's far better to pay it than do without the services. In old Austria where I live, people just love the free dams that where built after the last few floods (the contractors where even happier), the free playgrounds and soccer stadiums, the heavily subsidised public transport system, the 'Gesundheit fuer Alle' (stand in line for 8 months to see an opthalmologist, free of course). Bregenz (our local capital) recently staged an ARTevent, at which a hog was publicly slaugethered in front of a luring audience and the meat thereafter served to the hungry gourmands. Wir tun etwas für die Kunst! Sicher. But think about it: Is this not a perfect picture of modern culture? The spectacular sadistic thrill or even shock, the rotten morbidity and perversion, climaxing in the incorporation of its manifest results? Yes, dogs returning to their vomit, exactly. This is not the gummint, it is US. Given the near universal presence of various flavors of socialist government, maybe it's best to choose a new home based on other concerns. You can't escape it, so evaluate on other things. If we're going to have a socialist government, let's pick one that does it right, as it were. As Taylor suggests, there are plenty of places reasonably pleasant and imminently more tolerable than here. Whole swathes of Europe have been doing it fairly well for a very long time. We never will, because we lack the huge legacy of culture and custom. Otherwise, we stay and ride out the storm for reasons we cannot recommend to everyone. In my case, I'm convinced God has called me to stay, as the future upheavals will create my primary mission field. Sure is alot of fine talk , but talk dont buy whisky, and Im gettin awful thirsty. You guys are gonna have to forgive me Im a product of Uncle Sams school. 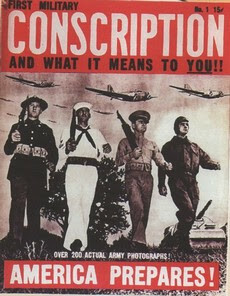 Conscription not only means killing in the name of the ubiquitous State, it also means you just got the death sentence. If you, as a supposedly "free" citizen, do not have the right to say "NO" to conscription then you're nothing more than a conditional slave idling on borrowed time. Its plain and simple to see so expect your masters to be calling soon. Get ready with your answer. I for one am desperately trying to figure out how to get away. With family responsibilities its not as easy as being a single man but it is doable. When it comes down to a "lifestyle", or having my children gunned down in foreign escapades engineered by evil men, then I'll gladly give that up. I'm not a blogger, but constantly read the same concerns that "Taylor" and other authors of numerous other blog sites write. For some reason I've never gotten into the writing I just enjoy the reading. Taylor's comments particularly struck me which is why I thought I would send a word of encouragement/advice. There are other places in the world one can go. I, personally, have found that place. It is the Republic of Panama and I would encourage anyone who thinks along Taylor's lines to research this amazing country. I won't rant about it. You all are clearly plugged in to the internet. Now go see for yourself. PS- Panama has no central bank, is not bound by legal tender laws, protects private property under constitutional law, has Johns Hopkins Med Center, 3 hrs direct from many major US airports, no standing army, beaches, mountains, 1/3 the cost of US living, Safe, ...you get the point. I too am young, have a family and the guts to put them above all else. All the best.